Light Grey Art Lab is a gallery & art events space in Minneapolis, Minnesota that focuses on bringing all types of artists and designers together to exhibit, participate, learn and share experience. They host various Residency programs, and I was accepted into their Iceland 2018 Residency program as apart of Team Vatn!! It was a truly one of a kind experience with the absolute best people I could've asked for. I'll go over some of the events that happened! I got there a day early and walked around Reykjavik and met some very friendly cats!! 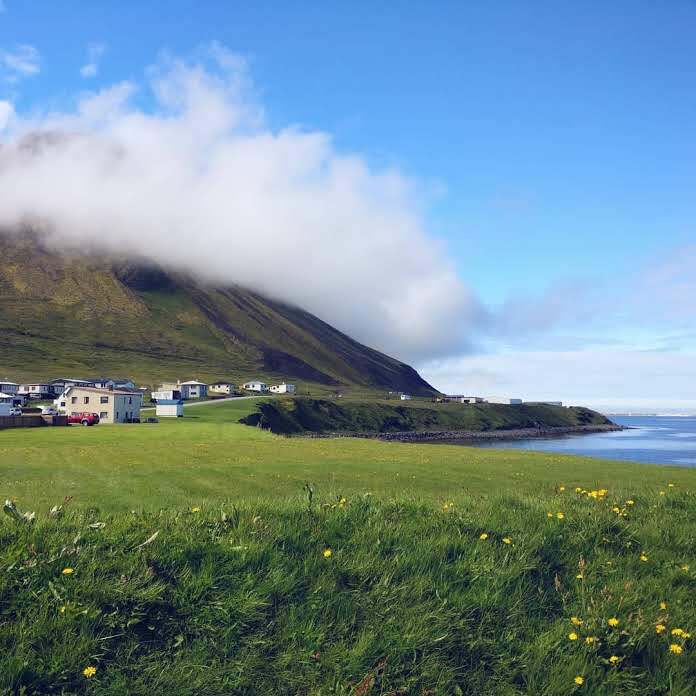 All 11 of us in Team Vatn stayed in a house together in Ólafsvík near the Snaefellsjoekull National Park. While at the locations, we were encouraged to take the time to draw, relax, or hike around. We got to see a number of landscapes with rich lore, different types of Icelandic animals, and learned some of the native plants & moss species. Each day had various planned adventures, packed lunches, and at night/ morning we had our workshops. Generally, the workshops focused on our different career paths and how we ended up where we are today! From a storyboard artist at Cartoon Network to an Embroidery artist, and even a Pop-up Experience artist!! There were so many artists from all over, and each of our journeys are different. There were also a few interactive workshops, including us all making a song together using music equipment, learning how to embroider, and a workshop on how to brainstorm effectively. Louie Zong demoing a live interactive music making session!! Not every job is what you expect, and sometimes you need to shift what you're doing. A theme I found among many of the artists was that there were several pivots in their careers in which they changed the type of creative work they were doing. It takes time to learn how to be creatively fulfilled, and how doing a creative job to make a living changes things. There were several people that knew what they wanted to do from the start and went for it (freelancing for editorial content, creating their own business, photography) but in each of these stories there were lessons to be learned in how to cope and manage, and shift their work to make it financially and creatively viable for the long term. Travelling is an important part of creating art. Many of the artists in the residency expressed how traveling is apart of their artistic process that opens their eyes to more possibilities. Travelling inspired them to tell different stories, seek out new avenues for storytelling, and even to keep their audience engaged. Taking time away from art to focus on other things can spark even more ideas than just doing the same-old-same-old. Don't forget where you came from, as it can be one of your strongest influences. Learning to look inward and accept where you came from, and take what you want from that information is really important. This was another theme between the artists as they shared how the things they grew up with or learned when they were young came back to them as inspirations later in life. Whether it be polly pockets inspiring pop up experiences, to learning to sew and then picking up embroidery later down the line, this is part of what makes your art YOU! This trip actually inspired me to do something creative that isn't art!!! I have started to actually try to pursue singing / voice acting as a hobby and just have some fun without thinking about visuals. HUGE THANKS TO LOUIE FOR THIS!!!! I've wanted to do it for a long time but never had someone to work with to really push me into it and didn't know where to start on my own. I got to collaborate with Louie on a few songs of his new album Iceland. Thanks for working with me Louie!!! I met the most amazing, hilarious, and inspiring group of people and I'm super grateful to Jenny Wells and Julie Van Grol for helping organise the residency and getting us all together!! TEAAAAAAM VATN!!!! PUT YOUR HANDS IN FOR TEAM VATN!! !